To Teach Who Christ Is (www.toteachwhochristis.org) is an Archdiocesan-wide capital campaign to strengthen parishes, catholic schools and faith formation in the Archdiocese of Chicago. Every parish in the Archdiocese is participating in this effort. Each parish has been given a target goal for the campaign. The goal for St. Joseph Parish is $575,227. 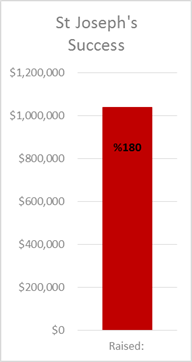 Sixty percent of all the money we raise up to goal remains with our parish. Anything we collect above the goal stays with our parish. After prayerful consideration and study, our parish has identified the most pressing needs in our parish community. St. Joseph is the cornerstone of our community. It gives us a place to congregate and to share God’s love in unison. We need to remodel the roof and the heating system to ensure safe and warm worship during our cold winters. Most parishioners drive to St. Joseph either to attend Mass or to drop off their children for school or religious education classes. The parking lot gets heavy traffic. We need resurface the parking lot to guarantee the safety of all drivers and fellow parish families. St. Joseph is blessed to have a wonderful school. However, we are in need of newer infrastructure that can facilitate the teaching of generations to come. We will provide tablets for students to excel in their own studies. A baptism, confirmation, wedding, and everything in between should be the brightest moments of our faith. We seek to upgrade the industrial lighting in our church to a system that will be energy efficient, controllable and soft.